In October 2013, the Telehealth Counseling Clinic (TCC) expanded its counseling services via telehealth to the Washington County/Faith Mission Health & Service Center in Brenham. To celebrate this one year partnership, they will be hosting an anniversary celebration on Thursday, October 30th from 3:00 – 4:30 pm at the Brenham center. The event will feature keynote speaker, Ms. Melissa Rowan, the Healthcare Policy Director at the Texas Counsel of Community Centers, who will be discussing the importance of expanding mental health services to rural areas. The partnership between the two entities evolved through TCC’s participation in the Texas Healthcare Transformation and Quality Improvement Program which funds innovative projects focused on improving the delivery of health services. With support from the state transformation program, TCC is able to expand their services to communities, like Washington County, who have limited access to mental health counseling. 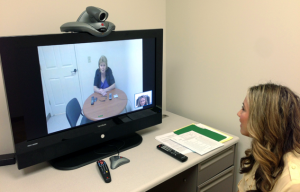 To make the services possible, Washington County and Faith Mission provided facility space, staffing support, and connectivity to the digital network that supports the telehealth connection and TCC utilized project funding to support equipment and personnel costs. The public is encouraged to attend the event, tour the facility, and meet Dr. Timothy R. Elliott, the Executive Director of the TCC and Dr. Carly McCord, Clinic Director of the TCC, to learn more about the counseling services offered. Please join us at the anniversary event to celebrate this successful partnership and the services they have provided to their residents.